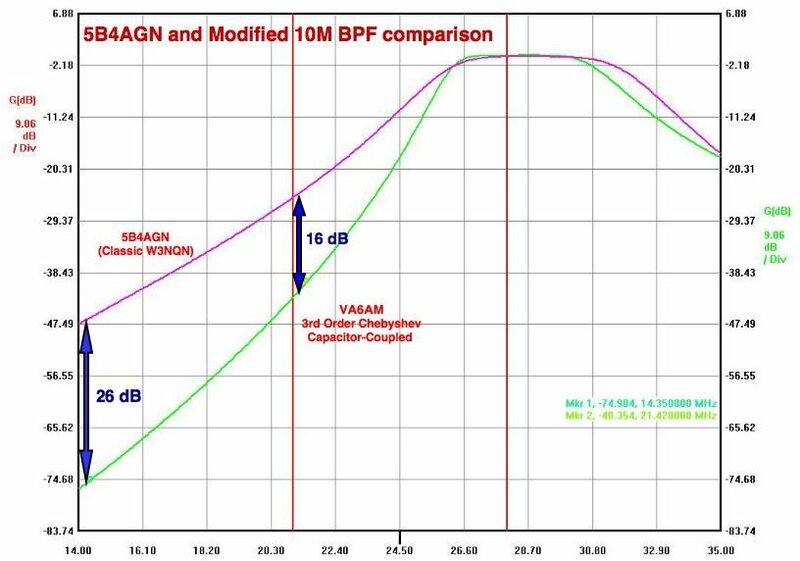 I built two 5B4AGN sets of BPFs for my SO2R low power setup and found that the classic W3NQN 10M band BPF is not good….at least for me -25dB Isolation for 15M band looks like not a good number at all. 5B4AGN BPFs are classic well-known W3NQN design 3rd order Chebyshev type BPFs. I wanted to have better attenuation for 20M band as the second harmonics could be a problem, especially if tribander is a main antenna. So, the 3rd order Chebyshev capacitor-coupled BPF is the good one to meet the requirements. I plan to use ti with VA6AM triplexer and together BPF and triplexer give more than -70dB of isolation between 15 and 20 meter band and more than -100 dB between 10 and 20 meter bands. Please, see schematics below. This is 3rd order Chebyshev capacitor-coupled BPF. Many different values could be calculated, if required. The graph below shows BPF Insertion Loss, Isolation and Return Loss. 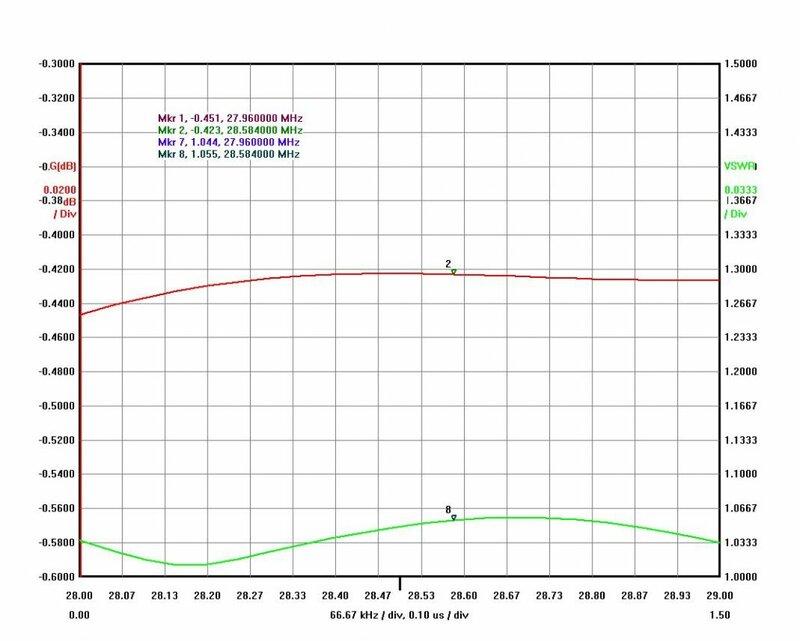 The graph below shows BPF In-Band Insertion Loss and VSWR. I used T130-0 iron powder toroids as their Q-factor is higher than those of T106-0 size cores. If you can use a larger enclosure, air coils could be a better choice as with their higher Q-factor you can get Insertion Loss below 0.4 dB. This is a good number for a 10M band. This schematics gives me -0.2 dB Insertion Loss for my High Power 10M BPF. Air coil must be made right for a maximum Q-factor. This 10M LP BPF with air coils can have Insertion Loss close to -0.3dB. Be aware that those LC shunt capacitors (grounded) stressed by a high current close to 5-7A for 100 watt output power and good quality capacitors highly recommended. For the same reason, air coils are better than those made on toroids, especially the central coil. 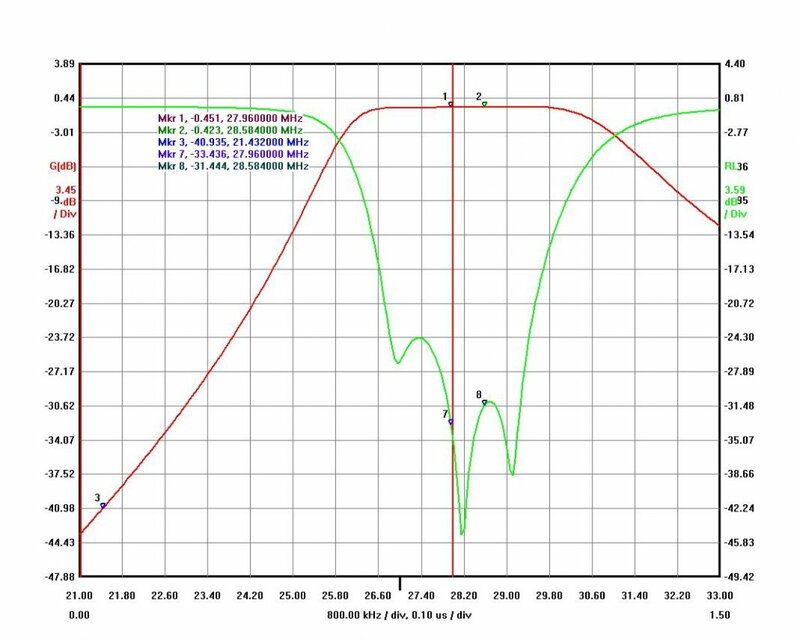 Return Loss parameter is very sensitive to a coupling capacitor values and some +- 0.5-1 pf adjustment could be required for the best RL (VSWR).